2006 ALL BREEDS PUPPY OF THE YEAR – FOR TASMANIA! We have just returned from a very exciting weekend away. Yesterday afternoon was judging of the Tasmanian Puppy of the Year contest. 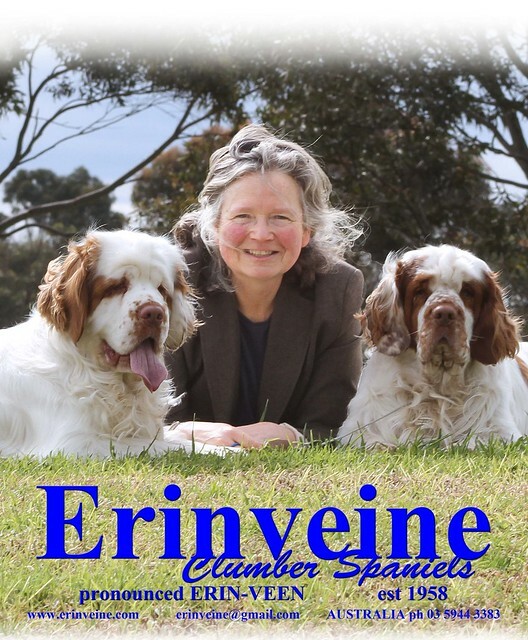 This year two Clumbers qualified – Bertie (Erinveine Expert Witness) owned by Bryan & Sheridan Courtney – and our own Digby (Ch Erinveine Vide et Crede). To qualify, a dog has to win a Puppy in Group award at an All Breeds championship show in the preceding year. To the best of my knowledge, this is the first time two Clumbers have qualified for this event in this state. The event was held in the grounds of Clarendon House, a stately home in Northern Tasmania. Judging is done by two judges and the system is a little confusing, but suffice to say that all the dogs are judged once by each judge, then each judge picks one from each heat to go through to the next round. Both Clumbers made it through to the second round :-)) as did my 11 month old Saint, Duncan. So, the next round is the semi-finals. Imagine my surprise when Digby’s number was announced as one of the dogs to go through to the preliminary finals!! Things were getting pretty exciting now, but I thought that was as far as we’d go as it was down to the top 11 dogs. They were divided into two rings and four winners were chosen to go into the final – wow, Digby’s number was amongst them. So, in for the final four – scary stuff. I was pretty sure we wouldn’t have a chance, but it such a thrill to have made it so far. The two rings were opened up into one big ring and we were told to make the most of the ring and “strut our stuff”. Along with Digby was a Chow Chow, Samoyed and Welsh Corgi (Pembroke). Digby, as usual, was a total show-off on the move – head up, looking at the crowd saying “look at moi!”. Stacked in the line-up I was a bit worried that the Chow behind him would put him off with its funny breathing, but Digby seemed to rise to the occasion and chose to ignore the noise. Anyway – final decision time and the judges are chatting away forever (or so it seemed), then they finally announce – the Tasmanian Puppy of the Year 2006 is the …. CLUMBER SPANIEL!!!! At this point I think I had momentary hearing loss – it did take a bit of time for the announcement to penetrate the old grey matter. Eye-witness reports are that I looked totally blank and dumbfounded for a period of time (OK, no rude comments about that being how I normally look). Digby thought it was all very well and good to have his mother making a fuss of him, but he was not keen to have those strange men drape sashes all over him, so they draped them over me. We had to have the official photos taken – while Digby was very keen to get back to his trolley for a snooze because it had all been very hard work this showing off business. Digby and I should at this point do our Oscar speech and thank Jan and Helen for breeding him; Jan for putting up with my constant e-mail questions and panic attacks; Jackie and Ian for letting Digby’s father, Tor, come to Australia; and special mention must go to my mother (aka Madam Clip) for her grooming skills (private joke that Jan and a few others – including most of the Tasmanian showing fraternity – will get). Oh, and by the way, Digby backed up today at a show and got RUNNER UP BEST IN GROUP and Best Intermediate in Group (sorry Jan, didn’t ring you with that result!!). Think I’ll go to bed now – back to the real world (and work) tomorrow.